Stems: Erect, simple or branching, usually grooved, glabrous to pubescent with flattened, dark hairs. Leaves: Opposite, variable, lanceolate or narrowly oblong to nearly linear, .6 to 5 inches long, .2 to 2.4 inches wide; lower leaves pinnately-divided, cleft or toothed; upper leaves reduced, coarsely and irregularly toothed to nearly entire, usually glabrous above, short-hairy on veins below, glandular dotted; tip narrowly pointed; base gradually tapering to short stalk. Inflorescences: Whorl-like clusters, distinct, 10-26 flowered, in leaf axils; bracts lanceolate to awl-shaped, less than 1/8 inch long; margins hairy. Flowers: Calyx tubular, bell-shaped, 1/10 to 1/8 inch long, 5-lobed; lobes equal, narrowly triangular, tips awn-like; corolla whitish, barely longer than calyx, regular or slightly 2-lipped; lobes 4; stamens 2; stamens and style extending beyond corolla. Fruits: Nutlets 4, egg-shaped, brown, glabrous, corky lateral ridges, 1-seeded; seeds tiny, brown. Habitat: Stream banks, ditches, lake shores; wet or moist soils. Uses: Native Americans used a compoud containing the plant to treat stomach cramps. 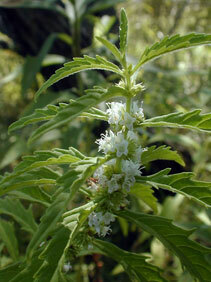 American buglwweed is an important honey plant. Comments: From Greek lykos "wolf" and pous "foot", alluding to the coarse teeth on the leaves resembling claws. It is said that "bugle" does not refer to the musical instrument but instead to a medieval Latin word for a women's hair pin. Although a mint, bugleweed lacks the mint-like odor.